Robert Eugene Lee, son of the late Samuel and Fannie Mamie (Davis) Lee, was born July 27, 1924, in the old Lee home place called Bean Hill, which was near Berry, Illinois. Robert “Bob” was the last of ten children. He passed away February 11, 2019, at his home in Dawson, Missouri, at 94 years of age. Bob’s mother died six months after he was born creating the need for Bob to live in several different places with relatives while growing up and attending school. 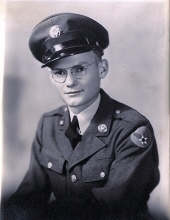 He began working at a very young age and in May of 1942, at age sixteen, he enlisted in the United States Army Air Force. He went to Europe and served in a light bomber squad of the 9th Air Force, an infantry division of the 7th Army during the Battle of the Bulge, and then back with the Air Force. He was honorably discharged December 21, 1945. During his service, he received a medal from the Normandy invasion and two battle stars, The Battle of the Bulge and the Battle of the Rhine. He also received a service connected disability and was a lifetime member of the D.A.V. Bob married Myrtle Johnson on August 2, 1944, in Great Milton, England, while on leave from France. Four sons were born to this union. Their first son, Michael, was born in England. After being discharged, Bob held various jobs working as a salesman, printer, carpenter, and painter. He was a member of the Carpenters and Painters Union and was a licensed building and painting contractor, owning his own business for a time. He and Myrtle lived in 37 different locations. In 1980, they retired to the Dawson, Missouri, community. In his younger years, Bob enjoyed hunting, especially pheasant and rabbits in Nebraska and deer in Colorado. After moving to Dawson, they opened a ceramics shop where they made various things including porcelain dolls and wildlife ceramics and held classes. Bob enjoyed helping with the pouring, airbrushing, and firing. Besides his parents, Bob was preceded in death by his wife, Myrtle, on January 9, 2016, one son, David Lee, and siblings, Stella Neil, Hiram Lee, Hazel Gripp, Verna Gibson, Helen Pescitelli, Clarinda Blagg, Eula Crawley, Charles Lee, and James Lee. He is survived by three sons, Michael Lee and his wife, Mary, of Mountain Grove, Missouri, Rodger Lee and his wife, Sheri, of Lakehead, California, and Gary Lee of Mountain Grove, Missouri, one daughter-in-law, Cindra Lee of California, six grandchildren, Misty Lee of Lee’s Summit, Missouri, Mindy Comeaux and her husband, Wade, of Mountain Grove, Missouri, Jennifer Williams and her husband, Steven, of Vallejo, California, Penelope Alverez and her husband, Carlos, of Dixon, California, Noah Lee of California, and Josh Lee of Vallejo, California, several great-grandchildren and great-great-grandchildren, and other relatives, neighbors, and friends who will dearly miss him. To send flowers or a remembrance gift to the family of Robert Eugene Lee, please visit our Tribute Store. "Email Address" would like to share the life celebration of Robert Eugene Lee. Click on the "link" to go to share a favorite memory or leave a condolence message for the family.